In Italian opera’s wondrous evolution from Paisiello to Puccini in the Nineteenth Century, more than half a century of the art form’s history was dominated by a single composer: Giuseppe Verdi. From the première of Oberto, conte di San Bonifacio in 1839 until the last laugh of Falstaff in 1893, Verdi’s operas were the musical manifestations of the turmoil and triumphs that engendered Italian unification and nationalism. Beyond Italy’s borders, far more composers were influenced by Verdi’s work than would ever have admitted it, and it was from Verdi’s heroines that Puccini’s Manon Lescaut, Mimì, Cio-Cio San, Minnie, and Liù received their lifeblood. Now, 116 years after Verdi’s death, affection for his music is stronger than ever. Operatic laity have never hesitated to declare passionate devotion to Verdi’s operas, but elitists and so-called connoisseurs have often hidden their tears for Gilda and Violetta. Perhaps Aida inspires fewer tears than some of her sisters, but few of opera’s protagonists have sparked imaginations and won devotion as Aida has done in the century-and-a-half since she first sang in 1871. Obliged throughout so much of the opera to take refuge within her own guarded hope for deliverance, sustained only by dreams of a life ever receding further into impossibility, she is the rare Verdi heroine for whom escape is feasible. When she might flee to the cherished land of her birth, Aida prefers death in the arms of her lover. Her ultimate choice is not the enslavement of living without the love for which she braved the perils of a princess’s hatred but the liberation of death on her own terms. She is a modern woman in an ancient setting, made timeless by music that throbs with every beat of her tormented heart. The longtime slogan of the National Endowment for the Arts, ‘a great nation deserves great art,’ can be easily adapted for the opera house. Grand stages deserve—and demand—grand opera. As the intimate theatres in which opera’s infancy and childhood transpired gave way to more expansive spaces, the dimensions of the music written to fill them—the music of opera’s tempestuous adolescence—also grew more imposing. Horns found work as more than harbingers of distant huntsmen, and string sections became small towns. The complex stage machinery of Baroque and Classical opera incorporated every relevant technological advancement, bringing everything from live animals to running water to the world’s opera houses. The charismatic Khedive of Egypt and Sudan, Ismail the Magnificent, undoubtedly wanted an opera that reflected his epithet to inaugurate the opera house built in Cairo as a part of his initiatives to modernize and cosmopolitanize the Egyptian capital. Though the first production suffered the ill effects of the Franco-Prussian War, the score that Verdi produced in fulfillment of the Khedive’s commission ingeniously amalgamated elements of Italian lyricism and Parisian grand opera in a work requiring grandiose scenic effects, episodic dance, and voices of the highest calibre. The set pieces of Verdi’s early and middle periods are still present, but the skill with which Verdi integrated them into the opera’s through-composed structure yielded a piece with tremendous theatrical impact. His republican sensibilities incensed, Verdi bitterly objected to the first Cairo performance of Aida playing to a specially-invited audience of aristocrats and dignitaries. The composer’s revenge goes on unabated: aside from Bizet’s Carmen and Puccini’s Mimì, few operatic heroines have touched as many ‘ordinary’ lives as Aida continues to do everywhere that opera is performed. 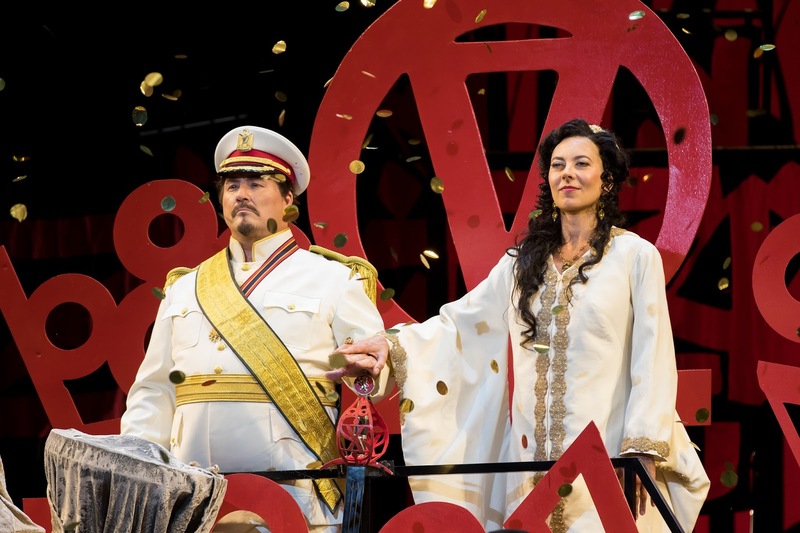 In an absence as inexplicable as many of Washington’s political quagmires, which is to suggest that money is likely at least partly responsible, Aida has not been staged at Kennedy Center since 1990, when the cast included Aprile Millo and Maria Noto as Aida, Vladimir Popov as Radamès, and Stefania Toczyska as Amneris. That the 1990 production failed to win its scheduled leading lady’s approval is part of American opera lore, but Kennedy Center’s new effort, a production shared with San Francisco Opera, Seattle Opera, and Minnesota Opera, is a colorful, even flamboyant experience in which audiences are asked not only to listen to Verdi’s music but also to ponder why the characters sing it. Under the direction of WNO Artistic Director Francesca Zambello, whose work exhibits an uncanny gift for finding new but valid ways of interpreting familiar repertory. Her groundbreaking productions of Berlioz’s Les Troyens and Wagner’s Der Ring des Nibelungen enriched these works’ performance histories with visions both innovative and intuitive. With the assistance of Associate Director E. Loren Meeker, whose gorgeous production of Madama Butterfly for North Carolina Opera is among that company’s greatest artistic successes, Zambello staged Aida with an apparent goal of bringing the opera’s narrative closer to modern audiences without distancing it from Verdi and his librettist, Antonio Ghislanzoni. The political fray that serves as the backdrop against which Aida’s personal dramas play out was meaningfully integrated into the production, emphasizing the tense atmosphere in which Aida’s, Amneris’s, and Radamès’s lives intersect. The tableau of Amneris and Radamès receiving the acclaim of the Egyptian people in the Triumphal Scene was reminiscent of images of Eva and Juan Perón on the balcony of Casa Rosada, and the subjugation of the conquered Ethiopians evoked scenes of oppression from Biblical times to Tiananmen Square. Jessica Lang’s athletic but artistic choreography was characterized by a range of motions both stylized and natural: muscles and emotions moved in tandem, and the dancers—Patrick Coker, Julie Fiorenza, John Harnage, Eve Jacobs, Kana Kimura, Milan Misko, Thomas Ragland, Rachel Secrest, and Jammie Walker, complemented in the entertainment for Amneris at the start of Act Two by a troupe of splendidly acrobatic boys—executed Lang’s steps expertly. The vehemence of the Egyptian priests’ calls for the slaughter of their Ethiopian prisoners was a timely reminder of the sickening toll of fanaticism, making the horrors of Aida’s life at the mercy of her foes real for the audience. Art cannot and must not always be comfortable and comforting. Art plays a vital rôle in altering perceptions and ending prejudices, and in doing so it must press observers to face truths that are less threatening when ignored. Zambello’s Aida is not a Boudicca, Jeanne d’Arc, or Libuše, but she is a woman with a fully-developed social conscience that did not impede her ability to loft Verdi’s melodies to the farthest reaches of the auditorium. This Aida leapt from imagination to stage via the concept design and sketches of graphic artist RETNA (né Marquis Duriel Lewis). Patrons who expected a graffiti artist’s Aida were either surprised or disappointed. His was no glitzy but generic Hollywood-esque Old Kingdom with cardboard pyramids and potted palms. Rather, the opera house’s stage became the epicenter of a functioning totalitarian state in which clerical authority superseded even royal prerogative. RETNA’s sketches produced artwork that dressed the stage in dazzling jewel tones. The visual symbolism incorporated into virtually every aspect of the production was remarkable for both looking authentically Egyptian and being wholly original. Even without an ankh to be seen, the production was more faithful to Verdi’s score and Ghislanzoni’s libretto than many stagings that go to ridiculous lengths in efforts at achieving ‘authenticity.’ Bringing to his work on this production nearly fifty years of experience, Michael Yeargan designed sets that were ideal canvases for RETNA’s graphics. Intelligently illuminated by University of North Carolina School of the Arts alumnus Mark McCullough’s lighting designs, the sets were dynamic without being distracting. The military attire central to Anita Yavich’s costume designs for the male characters would not have been out of place in Mussolini’s Italy, Stalin’s Soviet Union, Castro’s Cuba, Gaddafi’s Libya, or Mubarak’s Egypt, and Aida’s simple dress contrasted starkly with the stunning citrine, pure white, and sapphire gowns for Amneris. 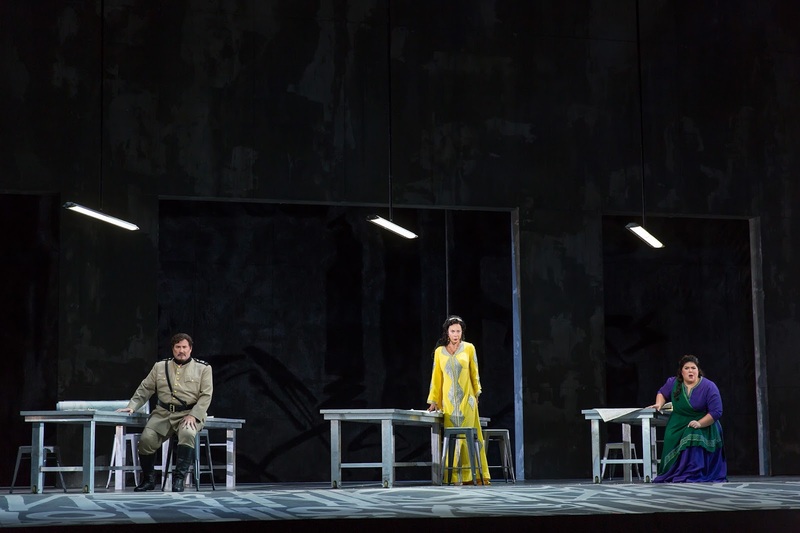 The visual components of this Aida amplified the emotions of Verdi’s music and Ghislanzoni’s words, not grasping at manufactured relevance but harnessing the wealth of pertinence that already exists in the opera’s drama. Conductor Evan Rogister paced the performance with energy, but his leadership was occasionally undermined by idiosyncratic tempi and breakdowns in coordination between stage and pit. Balances and timing in the largest ensembles were fortunately spot on, but there were instances in which principals and conductor disagreed about niceties of phrasing. Still, Rogister cued the singers impressively, and his conducting was attuned to the subtleties of Verdi’s orchestrations. Verdi composed a large-scale Overture for Aida as an afterthought but ultimately preferred the simpler Preludio with which he originally launched the opera. At Rogister’s slow tempo, the music seemed almost Impressionistic: unexpectedly, Pelléas et Mélisande loomed as prominently on the musical horizon as Otello. Throughout the performance, the WNO Orchestra’s playing was marvelous, with the masters of the difficult herald trumpets in the Triumphal Scene earning particular admiration for their flawless intonation. The rhythmic bite of the musicians’ performances of the dance interludes—the Danza sacra delle sacerdotesse (actually della sacerdotessa in this production) in the second scene of Act One, the Danza di piccoli schiavi mori in the second scene of Act Two, and the Ballabile in the Triumphal Scene—gave these passages the momentum that they need. Chorus Master Steven Gathman rehearsed the WNO Chorus to a level of preparation that rendered the choral singing one of the finest elements of the performance. As Pharaoh’s army, the Egyptian populace, the captive Ethiopians, and the priests standing in judgement of Radamès, the choristers sang fantastically. Unlike their colleagues at Teatro alla Scala and the Metropolitan Opera, WNO’s chorus and orchestra cannot boast of career-long acquaintances with Aida, but their performance benefited tremendously from the absence of routine. Washington National Opera’s Domingo-Cafritz Young Artists Program is a phenomenal source of young talent with which to populate the casts of the company’s productions, and enjoyment of this Aida was markedly enhanced by the presence of well-trained singers with voices of true quality in rôles in which mediocrity is all too frequently encountered. As the Messaggero who brings the momentous news of the Ethiopians’ invasion of Egypt, tenor Frederick Ballentine voiced ‘Il sacro suolo dell’Egitto è invaso dai barbari Etiopi’ incisively, his voice secure throughout the range of the music. In the second scene of Act One, soprano Madison Leonard sang the exotic exhortation ‘Possente Fthà, del mondo spirito animator’ with attractive tone and excellent breath control. Both of these young artists will be welcome additions to the rosters of the world’s opera companies. Another alumnus of WNO’s Domingo-Cafritz Young Artist Program, bass Soloman Howard has already offered audiences a plethora of evidence of his mastery of Verdi repertory, which he will expand further with his portrayal of Sparafucile in North Carolina Opera’s January 2018 production of Rigoletto. As the Re d’Egitto, the rôle of his Metropolitan Opera début, the strikingly handsome singer’s Pharaoh exuded the confidence that comes with unflappable comfort with the music. Vocally, his performance began promisingly and continued to gather strength with each successive phrase. In Act One, Howard voiced ‘Alta cagion v’aduna, o fidi Egizii’ with firm, rounded tone, and he declaimed ‘Iside venerata di nostre schiere in vitte già designava il condottier supremo’ with the majesty of a man in communion with his deities. His ‘Su! del Nilo al sacro lido’ radiated patriotic fervor. In Act Two’s Triumphal Scene, Howard’s Re addressed Radamès with a robust ‘Salvator della patria, io ti saluto,’ but his solemn delivery of ‘Al tuo consiglio io cedo’ suggested that a shrewd statesman lurked behind the warmongering façade. In the long performance and recording histories of Aida, many voices have been heard in the Re’s music that caused listeners to wonder whether it might have been Pharaoh’s wobbling that dislodged the Sphinx’s nose. There was no wobbling in this performance to endanger the integrity of Egypt’s infrastructure, but the sheer power of Howard’s vocalism was awesome. Imposing bass Morris Robinson was a Ramfis who towered over his countrymen, in stature and in menace. A priest who did not hesitate to use violence to advance his agenda [even the unoffending Messaggero fell victim to his fists], this Ramfis was unmistakably an ancestor of the Grand Inquisitor in Don Carlo. In Aida’s opening scene, he sang ‘Sì: corre voce che l’Etiope ardisca sfidarci ancora’ zealously, and ‘Gloria ai Numi! ognun rammenti ch’essi reggono gli eventi’ poured from him like the surging Nile. ‘Mortal, diletto ai Numi, a te fidate son d’Egitto le sorti’ in the scene in the Temple of Vulcan was dispatched with near-fanatical ardor. There was no lunging for the top F: the note was in the voice, and Robinson found it effortlessly. The rugged brawn of his singing was stirring, but his handling of the lovely cantabile ‘Nume, custode e vindice di questa sacra terra’ was also riveting. It was obvious in his granitic ‘Ascolta, o Re’ in the Triumphal Scene that this Ramfis expected his advice to be heeded. It was equally apparent in ‘Vieni d’Iside al tempio’ in Act Three and in the Judgment Scene in Act Four that neither Amneris’s despair nor her fury were of the slightest consequence to Ramfis. Robinson voiced ‘Spirto del Nume, sovra noi discendi!’ lithely. His thunderous repetitions of ‘Radamès!’ were terrifying: the final utterance of the name, each syllable forcefully articulated, was haunting. In a sense, Ramfis is the last man standing when Aida reaches it conclusion. Aida and Radamès have perished, Amneris is devastated by guilt, and the legitimacy of the King’s reign has been weakened by his espousal of a traitor. In some performances of Aida, these outcomes seem to be the work of destiny, but Robinson was a Ramfis who manipulated the drama from the start. When his machinations were enacted with singing of such vigor and security, the ambitions of this Ramfis could not be thwarted. His portrayal of the title rôle in Opera Carolina’s 2014 production of Nabucco confirmed Gordon Hawkins to be one of today’s most accomplished Verdi baritones. 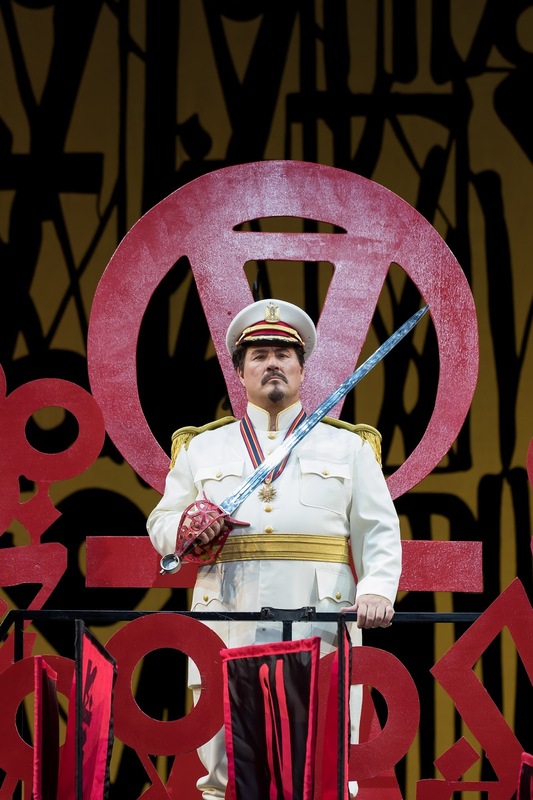 In WNO’s 2016 staging of Wagner’s Götterdämmerung, his unforgettable Alberich disclosed Hawkins’s ability to markedly influence a performance even as a character whose time on stage is relatively brief. As Amonasro in WNO’s Aida, these feats merged exhilaratingly. First seen among the humiliated Ethiopians in Act Two’s Triumphal Scene, the nobility of Hawkins’s Amonasro was discernible despite the monarch’s efforts at remaining anonymous. His cry of ‘Non mi tradir!’ to Aida was as much a royal decree as a statement of desperation, and the top Fs that punctuated his plea for the conquering Egyptians to show mercy, ‘Questa assisa ch’io vesto vi dica che il mio Re,’ were galvanizing. The voice sometimes sounded unsteady, but Amonasro’s music is ferocious, and Hawkins’s voice is a large instrument used with such control that moments of strain were not worrying. Reuniting with Aida along the banks of the Nile—evoked by sounds of a nocturnal riparian setting in Verdi’s score if not visually in this production—in Act Three, Hawkins sang ‘A te grave cagion m’adduce, Aida’ muscularly. Then, his account of the cantabile dolcissimo ‘Rivedrai le foreste imbalsamate’ was tenderly paternal. There is pitifully little tenderness in Amonasro’s bullying of Aida, and Hawkins hurled ‘Su, dunque! sorgete, egizie coorti!’ at her ruthlessly, roaring the top F♯. As Aida implored him to take pity on her suffering, Hawkins’s Amonasro retreated, covering his face with his hands and clearly feeling the sting of his own cruelty. A father’s compassion returned in the baritone’s voicing of ‘Pensa che un popolo vinto,’ and the ascent to top G♭ was now an expression of victory rather than viciousness. His shout of ‘Di Napata le gole!’ after Radamès unwittingly revealed the secret of the Egyptians’ intended route into battle bore the weight of the blow that turned the opera’s course inexorably towards tragedy. Amonasro is an intriguing anomaly in Verdi’s studies of parent-child relationships, but he is not the heartless brute that some singers portray. There was unusual depth in Hawkins’s realization of the part, and he sang Amonasro’s music with aptitude that is even more unusual today. Some of the best singing heard at the 2017 Bayreuther Festspiele was supplied by mezzo-soprano Marina Prudenskaya, whose Waltraute in Götterdämmerung brimmed with urgency and vocal opulence befitting a daughter of Wotan. [She returns to Bayreuth in 2018 to sing Fricka and Schwertleite in Die Walküre.] Looking as glamorously regal as Elizabeth Taylor in Cleopatra, Prudenskaya was a calculating Amneris who toyed with Aida and sprang her fatal trap with feline sensuality. The core of her interpretation was restraint, however: there was no excess, not one superfluous gesture. In her Act One duet with Radamès, Prudenskaya intoned ‘Quale insolita gioia nel tuo sguardo!’ caustically, but her purring of ‘Vieni, o diletta, appressati’ in the subsequent trio with Aida and Radamès was slyly casual. Later, celebrating Radamès as the gods’ choice to lead the Egyptians into battle, she voiced ‘Di mia man ricevi, o duce, il vessillo glorioso’ with conspicuous affection. The scene for Amneris and her attendants that opens Act Two can seem out of place. The ladies in Amneris’s company are identified by Ghislanzoni as slaves but were courtiers in Zambello’s production, a believable departure from the libretto: Amneris shaming Aida before gossiping Egyptian ladies heightened the scene’s dramatic significance. Merely as a setting for Prudenskaya’s supple singing of ‘Ah! vieni, vieni, amor mio,’ the scene was gratifying. In the duet with Aida that follows, the mezzo-soprano unleashed an avalanche of duplicity with ‘Fu la sorte dell’armi a’ tuoi funesta.’ Affected sweetness pervaded her singing of the cantabile ‘Io son l’amica tua’ and ‘Ebben: qual nuovo fremito ti assal, gentile Aida?’ The character’s fury explodes with ‘Trema, vil schiava,’ and Prudenskaya’s heated performance ignited both music and text. Perhaps having learned from the examples of interpreters of Amneris who burn out before meeting the demands of Act Four, there was perceptible caution here and in her traversal of ‘Venga la schiava, venga a rapirmi l’amor mio,’ the treachery imparted by inflection rather than volume. At the start of Act Three, this Amneris responded to Ramfis’s instruction to pray with a touchingly sincere ‘Sì; io pregherò che Radamès mi doni tutto il suo cor.’ The savagery of her censure of Radamès’s treason at the act’s end was intense but tempered by sadness. To seek a comparison in Prudenskaya’s German repertoire, Act Four of Aida is for Amneris an ordeal similar to what Fricka faces in Act Two of Die Walküre. Alone with her thoughts as the act begins, Amneris contemplates the consequences of her jealousy. 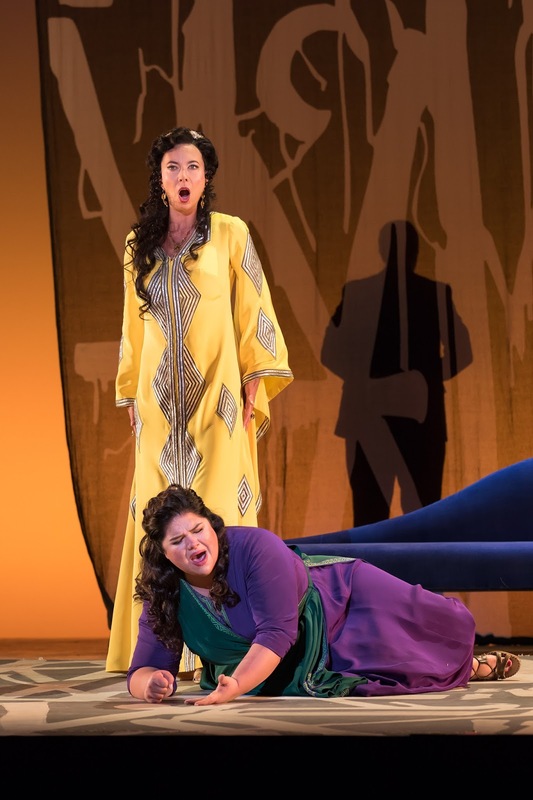 Musing over Aida’s escape from Amneris’s clutches, Prudenskaya infused ‘L’abborrita rivale a me sfuggia’ with bile, but she avoided vocal harshness. Confronting Radamès for the last time, this Amneris attempted to maintain a calm detachment in ‘Già i sacerdoti adunansi arbitri del tuo fato,’ but as she sang of her love being supplanted by anger she became increasingly frantic. Her voice seething with emotion, Prudenskaya dominated the pair of exposed top B♭s. Amneris’s loathing of Ramfis and his self-serving exercise of pseudo-religious authority erupted in the Judgment Scene, but the voice was never unduly pushed. The sudden frailty of her ‘Ohimè!...morir mi sento’ and ‘Numi, pietà del mio straziato core’ was a moving indication of Amneris’s love for Radamès. Even the bright, sonorous top A with which she ended the scene was guarded, the ire directed at Amneris’s flawed character as much as at the hypocritical priests. In the opera’s final scene, Prudenskaya sang ‘Pace t’imploro, salma adorata’ as a broken woman. Prudenskaya was an uncommonly cerebral Amneris, a vulnerable woman aware of her power but also powerless. There were ensemble passages in which she could not be heard as clearly as her colleagues, but this perceptive artist took the ethos of the production to heart by looking beyond the notes on the page and sharing with the audience why her Amneris sang them. Hailing from Arlington, Virginia, a stone’s—or a Washington Nationals pitcher’s—throw across the Potomac from Kennedy Center, tenor Carl Tanner is the standard bearer for the mostly-extinct and little-remembered tradition of his fellow American tenor Barry Morell. Musical, insightful, and effective in lyric and heavier rôles, he shares with Morell the under-appreciated distinction of being an exceptionally reliable artist who brings to virtually every performance the preparedness and dedication that some singers only fitfully exhibit. As Radamès in this Aida, Tanner was bold and charismatic, his singing stentorian when appropriate and always aptly romantic. 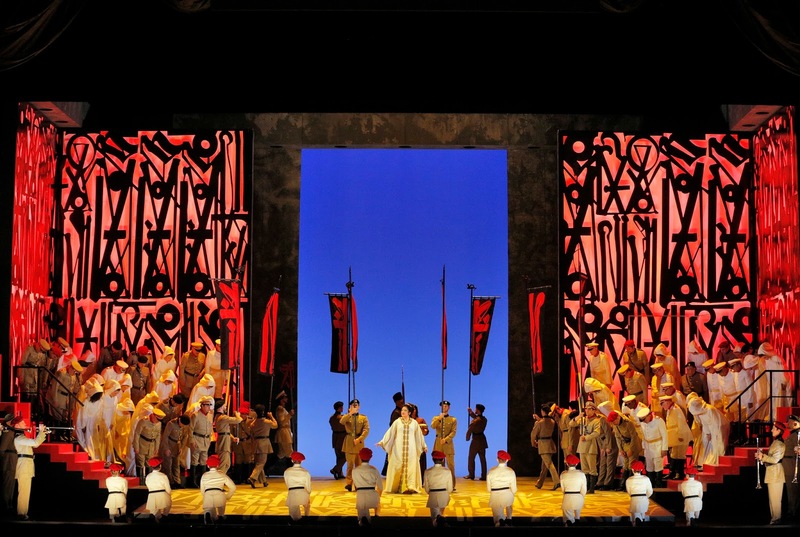 In the opera’s first scene, his Radamès daydreamed with a schoolboy’s enthusiasm about being chosen to command Egypt’s troops. It is often alleged that Richard Strauss hated the tenor voice, but only in Die Frau ohne Schatten did he rival Verdi’s ‘gift’ to the tenor in Act One of Aida. Beset by the recitative ‘Se quel guerrier io fossi!’ and romanza ‘Celeste Aida’ with only a few moments of warmup, Radamès immediately earns sympathy, but no forgiveness was necessary for Tanner’s performance. He brought to ‘Celeste Aida’ genuine legato and unflinching attack on its three top B♭s. In the following duet with Amneris and the trio that ensues, he sparred almost playfully with Prudenskaya, but the change in his attitude upon Aida’s entry was appreciable in his enunciation of ‘Dessa!’ Radamès having been announced as the celestially-appointed leader of the Egyptian army, Tanner voiced the cantabile ‘Nume, che Duce ed arbitro sei d’ogni umana guerra’ in the second scene with bravado, the repeated top B♭s in the scene’s final pages conveying the character’s pride and elation. In Act Two’s epic Triumphal Scene, Tanner approached both ‘Re: pei sacri Numi, per lo splendore della tua corona’ and ‘Spento Amonasro, il re guerrier, non resta speranza ai vinti’ with the simplicity of a decent man speaking his mind rather than the complexity of a schemer considering the implications of his words. Rendezvousing with Aida in their duet in Act Three, Tanner’s Radamès was again the free-spirited youth with absolute faith in the kindness of fate. Singing ‘Pur ti riveggo, mia dolce Aida’ with disarming passion and gleaming tone, he made Aida’s task of learning from him the Egyptians’ intended route into battle all the more distressing. He shaped his performances of ‘Nel fiero anelito di nuova guerra il suolo Etiope si ridestò’ and ‘Sovra una terra estrania teco fuggir dovrei!’ with sensitivity, making an admirable endeavor to comply with Verdi’s request for a dolce top B♭. The duped Radamès betrayed by Amneris to the bloodthirsty Ramfis, Tanner fired a preemptive volley with his clarion ‘Sacerdote, io resto a te,’ his top As formidably heroic. The scene for Radamès and Amneris in Act Four contains some of the most breathlessly tense music that Verdi wrote, and Tanner and Prudenskaya engaged in a battle of wills that was an eery counterpart to their first meeting in Act One. Tanner eschewed bitterness in his traversal of ‘Di mie discolpe i giudici,’ rejecting Amneris’s arguments resolvedly but not unkindly. At the end of an arduous afternoon, Tanner sang particularly beautifully in the opera’s final scene. The resignation expressed by his reading of ‘La fatal pietra sovra me si chiuse’ was palpable, and his mezza voce in ‘O terra, addio’ gave Radamès’s final moments humanity and humility, not least by enabling him to avoid resorting to falsetto on the top B♭s. Especially at the top of the range, Tanner was happiest at full volume, but his happiness was never prized above adherence to the composer’s wishes. Tanner sang Radamès’s music extremely well, but the foremost achievement of his performance was his credible depiction of Radamès as a man whom both Aida and Amneris could love. Soprano Leah Crocetto, who returns to Kennedy Center in March 2018 to sing Elisabetta in WNO’s production of Verdi’s Don Carlo, was an Aida whose experience in the rôle in the San Francisco première of Francesca Zambello’s production was apparent in every musical and dramatic detail of her performance. The first Aida, Antonietta Anastasi-Pozzoni, was acclaimed in Milan for her portrayal of Marguerite in Gounod’s Faust but transitioned in the years after Aida’s troubled Cairo première to singing mezzo-soprano rôles, making it impossible for modern Verdians to surmise precisely how her voice sounded. Aida was sung in the opera’s first European production at La Scala, considered by Verdi to be the true première, by Teresa Stolz, a versatile singer who was denied the honor of creating the rôle in the Egyptian première by musical politics and for whom Verdi also wrote the soprano solos in his Messa da Requiem. Though she reintroduced Leonora to the public in the first performances of Verdi’s revision of La forza del destino, Stolz also had extensive and much-lauded bel canto credentials. Her refined singing in San Francisco Opera’s 2015 production of Verdi’s Luisa Miller affirmed Crocetto to be an artist worthy of Stolz’s legacy, and her Aida for Washington National Opera was a noteworthy personal and professional success. Making her first entrance in Act One, Crocetto moved gracefully but deliberately, from the start establishing Aida as a woman of royal lineage subjected to the profound shame of servitude. Joining the trio with Amneris and Radamès, she sang ‘Ohimè! di guerra fremere l’atroce grido io sento’ urgently, her soaring top As and fortissimo top B rousing but unexaggerated extensions of the line. Aida’s aside of ‘Mio padre!’ when it is learned that Amonasro was the leader of the invading Ethiopians was delivered by Crocetto with special emphasis, her character daring to envision her freedom restored. She voiced ‘Per chi piango?’ with dignity, lofting her top C over the ensemble with technical finesse. The challenges of ‘Ritorna vincitor!’ were overcome with lavish assurance. The soprano’s slashing top B♭ crowned an incendiary account of ‘L’insana parola, o Numi, sperdete!’ Crocetto encapsulated the essence of Aida’s anguish with her wrenching ‘I sacri nomi di padre...d’amante.’ Impressive as her full-throttle singing was, it was her ravishingly hushed voicing of ‘Numi, pietà, del mio soffrir!’ that was most memorable. The dramatic magnitude of Crocetto’s ‘Ritorna vincitor!’ was redoubled in Aida’s Act Two duet with Amneris. Voicing ‘Felice esser poss’io lungi dal suol natio’ mesmerizingly, the soprano projected Aida’s misery and trepidation across the footlights without distorting the musical line. Cresting first on a top B♭ and then on a brilliant fortissimo top C, she gave ‘Che mai dicesti! misera!’ and the agitated ‘Ah! pietà!...che più mi resta?’ wealths of expressivity. The voices of many Aidas are lost in the tumult of the Triumphal Scene, but Crocetto was always audible—and always heard with pleasure. Her exclamation of ‘Che veggo!... Egli?... Mio padre!’ was a poignantly private moment in one of opera’s most opulent public scenes. Verdi’s assault on the soprano’s upper register in the final minutes of Act Two is unrelenting, but the indefatigable consistency of Crocetto’s high notes prevailed. 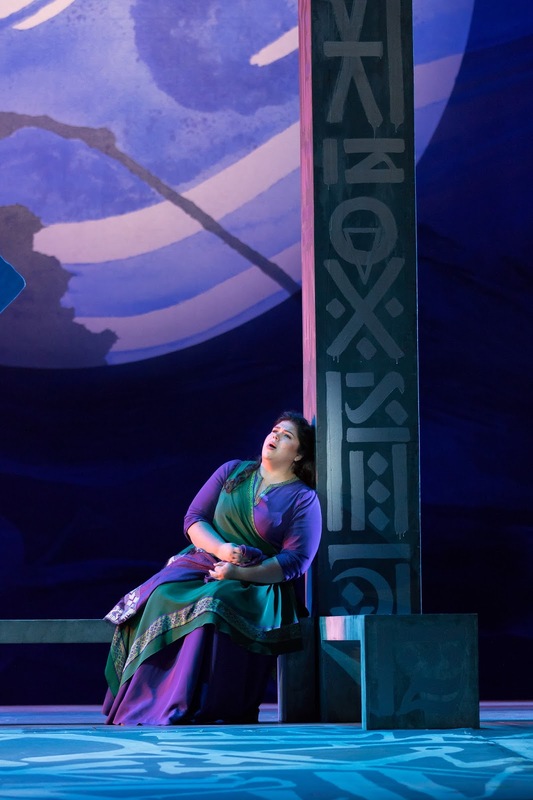 Slowly revealing her presence to Radamès in the final scene of Act Four, Crocetto’s Aida pronounced ‘Son io’ delicately, the words clearly intended solely for her beloved’s ears. She mastered the tricky writing in ‘Vedi? di morte l’angelo radiante a noi s’appressa,’ transitioning the mood of the scene from one of despondency to one of transfiguration. Crocetto and Tanner performed ‘O terra, addio’ like one singer with two voices, emphasizing the catharsis of their characters’ deaths. Alternately humbling herself before Amneris, scrutinizing her conflicting loves for Radamès and her homeland, or weathering her father’s denunciation, Aida never enjoys true happiness during the course of the opera, and she takes control of her life only by choosing to end it. Crocetto’s performance provided great happiness, however. When sung and acted so compellingly, Aida, too, has her revenge on her oppressors. As in all of Verdi’s late operas, the real marvel of Aida is its juxtaposition of intimate emotions with storytelling on the grandest of scales, and that grandeur is in the music and the ways in which individual sentiments and universal themes are intertwined. Aida does not need camels and endless parades of shendyt-clad supernumeraries. 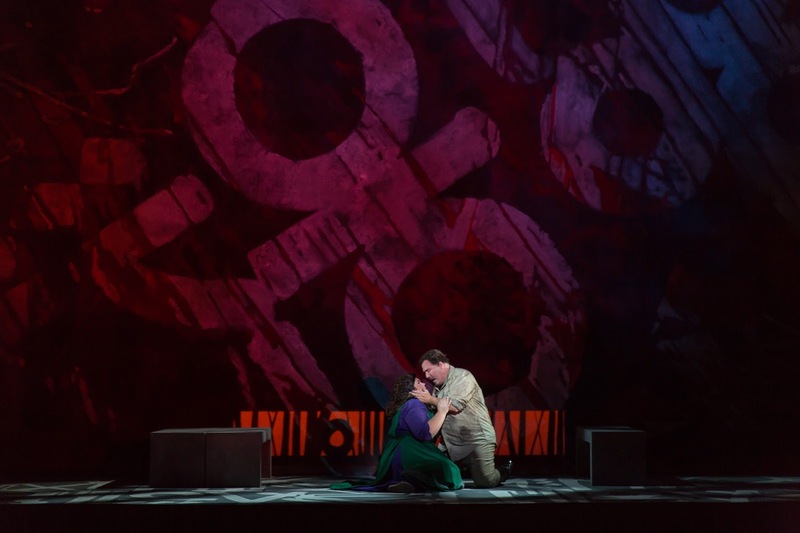 Aida needs great voices and a thoughtful setting in which they can sing this amazing music, and Washington National Opera’s Aida gave Verdi and those who love his operas a rare opportunity to savor those needs being outstandingly satisfied. Apologies to the artists for the poor quality of the curtain-call photographs.